THQ says its "updated business strategy" will take the company away from licensed games for kids and instead focus on core game franchises and digital initiatives. 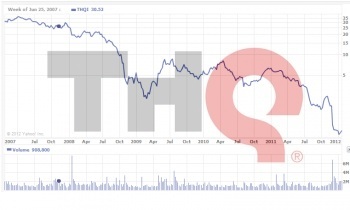 It's been a rough half-decade for THQ. The reasons are many and varied but the bottom line is a share price that plummeted from over 36 dollars to under 70 cents - 70 cents! - and an angry letter from an alleged ex-employee asking the obvious question: why does the CEO of a company that's seen 98 percent of its value go up in smoke still have a job? That letter came to light this morning and now, in what is a very interesting bit of timing [and I don't mean that ironically, I think it's genuinely interesting] THQ has announced a new business strategy to pull itself out of the doldrums. Licensed kids's games are out, Saints Row, UFC Undisputed and Warhammer 40,000 are in. "THQ will be a more streamlined organization focused only on our strongest franchises," THQ President and CEO Brian Farrell, who's been around for the whole ugly show, said in a statement. "The success of Saints Row: The Third is an example of what our revised strategy and focus can achieve. We have now shipped 3.8 million units globally and are currently expecting to ship between five and six million units lifetime on this title. Additionally, our robust digital content offerings for this game have resulted in the highest digital revenue of any console title in our history." THQ's five internal studios will focus on the publisher's "key franchises," including UFC Undisputed, Darksiders, Company of Heroes, inSANE, Saints Row and Warhammer 40,000, and it will also continue to work with "prominent external development talent" on both existing and new franchises. "THQ's goal is to optimize its portfolio for the current generation of consoles and to establish new franchises on the next generation of game devices," the company said. It also intends to "accelerate digital revenues by extending and supporting key console launches, and to create dedicated digital properties for emerging platforms." Sounds good to me. Talk is cheap but THQ clearly needs to do something, and while most of this statement is about as corporately vague as you'd expect, the general idea of getting away from cheap, churned-out games based on whatever licenses it can get its hands on is a solid one. Besides, it's not like there's anywhere to go but up, right?